Ever wake up with no voice? It’s like a teacher’s worst nightmare… I know. It’s happened to me. Multiple times. My first few years of teaching, every spring, I would get a case of laryngitis. Nothing else wrong with me – except that I couldn’t even barely whisper. What do you do? How do you manage? Some may stay home sick from school. Sorry, but that is just not me. My total number of sick days for my entire teaching career probably totals less than 25 days. Don’t get me wrong – when you’re sick, you’re sick. Take some medicine and get better. But what about laryngitis? What to do? And don’t forget about the first days of being back at school. You do so much talking, you practically don’t have a voice left by the end of the day! Well, over the years I’ve discovered a secret. Lean in closer, and I’ll share it with you! I call it Midgley’s Magic in a jar. I always keep a small mason jar with the mix in my fridge at school – just in case. It has saved me a few times – and some colleagues too. It’s so simple. And it’s healthy. In case you are wondering about chemicals and processed foods – don’t worry!! All mixed in a mug with hot water. Tada! It’s like an instant magic cure for your throat! I will often sip on this magic concoction the days I know I have a lot of talking to do. Or as soon as I feel the slightest, faint tickle in my throat, you can find me mixing a mug of this stuff! In a pinch, I’ve used straight lemon juice and ground ginger (from the herbs & spices) but to be honest, the fresh ingredients are the best. For my emergency stash at work, I just take a slice of lemon, an inch of ginger root, pour on some honey, and seal it in a mini mason jar. It stays in my fridge until I need it – just grab, and dump in a mug of hot water! 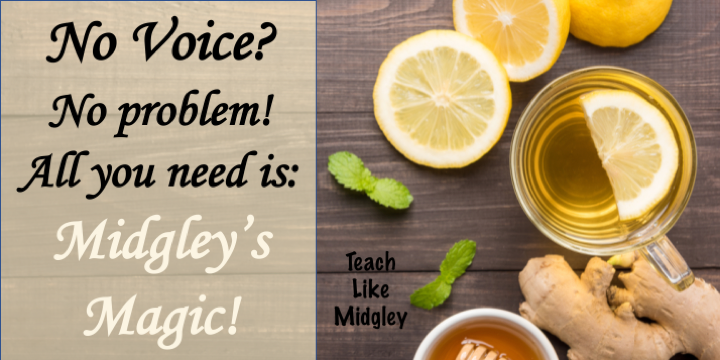 Continue sipping on it throughout the day – you’ll be amazed what Midgley’s Magic can do! !